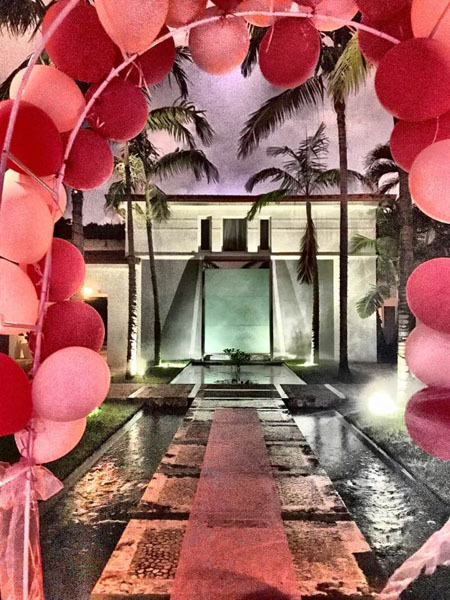 ‘Shangri La’, the appropriately named waterfront home on Hibiscus Island in Miami Beach is a revolving door for theme parties. This past weekend did not disappoint. Girls were told to dress in their “Barbie Best” while the boys were to toss on black or white suits. The occasion was the birthday party for the host’s girlfriend, Aneta Magdalena, a tall, leggy blonde babe with a fit, curvaceous body. Guests were greeted by pink balloons signifying the entrance. Once inside, it was like being transported into Barbie’s very own ‘Dream House’ full of pink plush furniture and pink plastic convertible cars. An illuminated life-size Barbie doll box was on display for all the real life Barbies to pose in. Pink champagne was the bubbly of choice for the occasion. The arrival of a birthday cake topped with a plastic Barbie doll signified the time for all the South Beach partiers to sing happy birthday to the girl of honor, Aneta. The DJ played perfect bubble gum-like tunes while all the coquettish Barbies danced around the stripper poles and licked the whip cream off the cake. Ahhhh…just another Saturday night in Miami for all the South Beach boys and girls! Hmmm…any ideas for the next Hibiscus Island theme party??? Here’s a link to the Hibiscus host with the most, George Wallner’s birthday party on Easter Sunday.